We are hosting our first New Year's party in our new house and I'm in a DIY-ing mode to come up with a unique, new year-ish centerpiece for our humble dining table. I came up with a design that incorporates my love for snowflakes, which is simple yet attractive. Best of all, it is people-approved! Initial design variations were initially posted for critiquing and tons of thumbs ups were given to final design. So, here I am sharing the goodie in case you're in the same party boat as we. 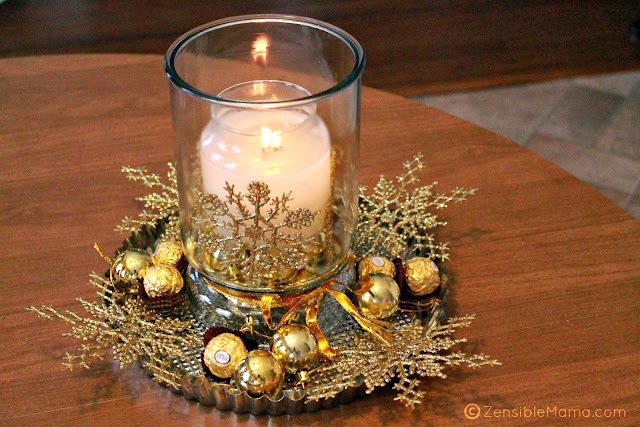 Arrange the gold ball ornaments inside the candle holder. Make sure they are arrange to accommodate your candle in an even level. Once final adjustment is achieved, place the 3 small snowflakes around the candles. Wound a ribbon on base of candle holder if there's a place for it. Next, place the finished candle holder on center of the silver platter. I actually used a tart pan with decorative patterns in this project. 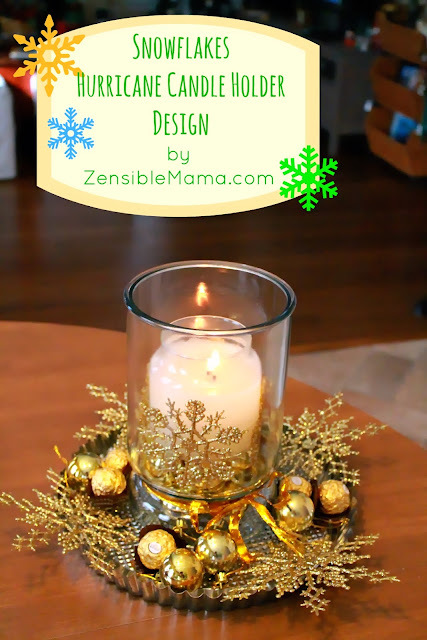 Arrange the large snowflakes around the candle holder on even spacing. Place remaining balls in between spaces. "Accessorize" it with the Ferrero Rocher chocolates for added treat for party guests. You can add your own twist by including your favorite chocolates or candies. Tip: You can use the hurricane candle holder on its own or pair it with another candle holder. Very pretty! And so easy to do. Thanks for sharing and I hope you have a wonderful party.